David Fisicaro has sent us this nice lounge for the garden, following the idea of ​​this post: Instructions and 3D plans of how to make a sofa for the garden with pallets Perfect for your garden to get away and relax a little bit. The mattresses are the classic ones made of wool, recycled for the occasion, it helps to redux the investment and don’t break the classic look of the furniture. As we have mentioned before, the furniture design follows the lounge link that I’ve indicated, in addition David has chosen to add some pallet planks to cover the base of the sofa, wrapping around the perimeter of it. In the center he has added a table that fits perfectly with the sofa, he has put a small pallet as a base and a larger one over it. Part of the platform forming the floor it’s also made of wooden pallets, in order to fit perfectly with the other pieces of the lounge furniture. David has also added this shelf made of pallets, which can be used as a drinks cabinet, library, or to put a stereo or a TV; the final icing on the cake for our lounge. Thank you very much for your input David! 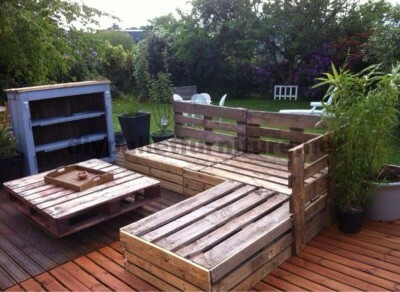 Do you like this DIY pallet lounge? Do you want to look for more DIY pallet sofas?